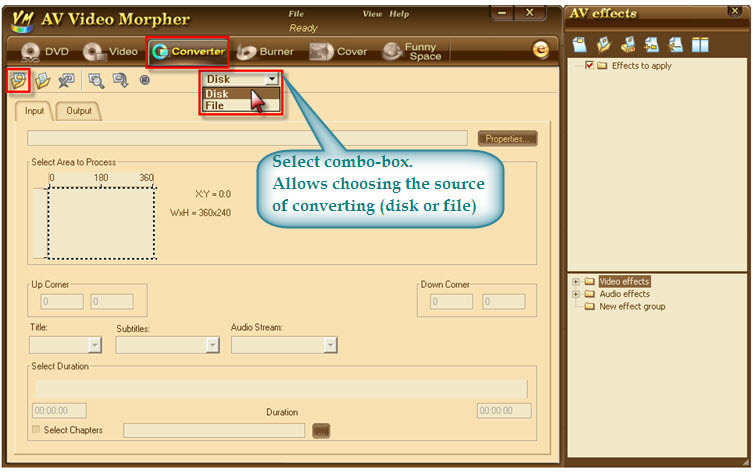 This will introduce a step by step guidance on how to convert a whole video or selected video areas to a new movie in *.AVI and *.WMV format. - Open the Video Morpher; select Converter module. - Drop down the Source box and select Disk for converting from a DVD | VCD | SVCD (or select File to convert from files on your computer). Note: for further detailed information on Video Morpher module and features, click on Help menu 8 select Help Topics 8 Search 8 type "Convert" into the Type in keywords to find box. 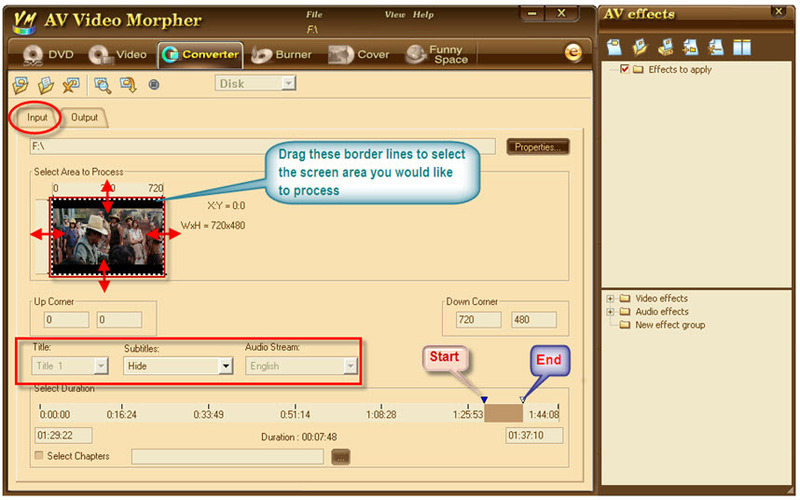 - Drag the border lines around preview screen to resize the corners you want to shoot. - Move the Start and End point covering the part you want to convert. - Drop down the Title box to select your favorite title. Do this step again with the Subtitles and Audio Stream box. - Click Preview button To preview and adjust the settings until getting your desired clip. Note: you can add effect(s) from the RIGHT panel - AV effects to the movie clip and then do the clip conversion with AV effect(s) on. - Drop down the Converting Mode and select AVI. 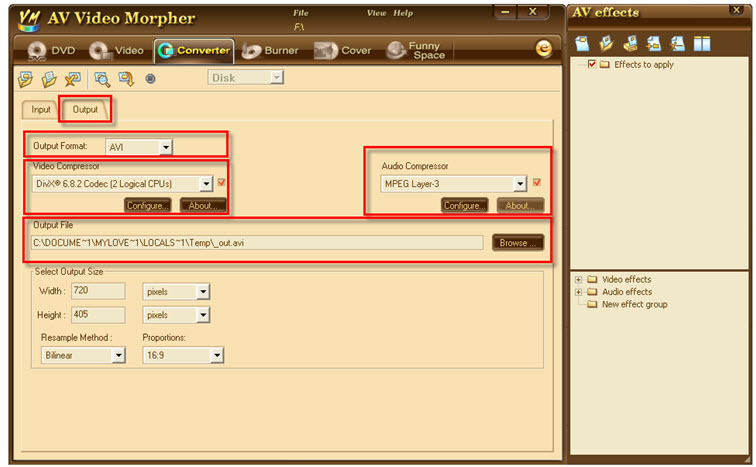 - Leave Audio Compressor as PCM by default. - For the Output File, click Browse and point to your favorite output folder. - Click Preview button Too preview and adjust the settings until getting your desired clip.Note: You can change the display of your clip to different proportion and resample within the Select Output Size area. Leaving them as default is recommended. - Check them all again by previewing the clip and adjust the settings as you wish. - Click Convert To start the conversion and wait until the message of conversion complete appears. Note: if you see any message like below (left), please just click YES to continue. If you click NO you will then be informed that the compression cannot be completed. Continue clicking on Convert button again right after that you may face the error message "Can't perform the operation: Unknown system error. Some of the system components are missing or works incorrectly". For such a case click OK, then wait for a minute and try again. Remember to click YES this time.